There is nothing quite like a great scone and these Rosemary and Lavender scones fit into the great scone category easily. Scones are typically thought of as being sweet and fat. 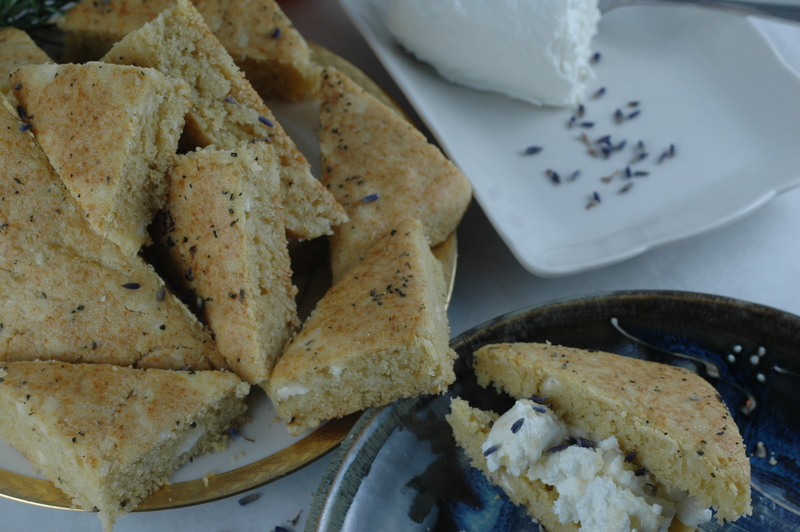 This recipe replaces the fat with goat cheese and the dough is delicately scented with rosemary and lavender honey. If you can’t find lavender honey, you can infuse honey with lavender buds to get the flavor. Put the honey in a double boiler, fold in the lavender buds and warm gently for a couple of hours. 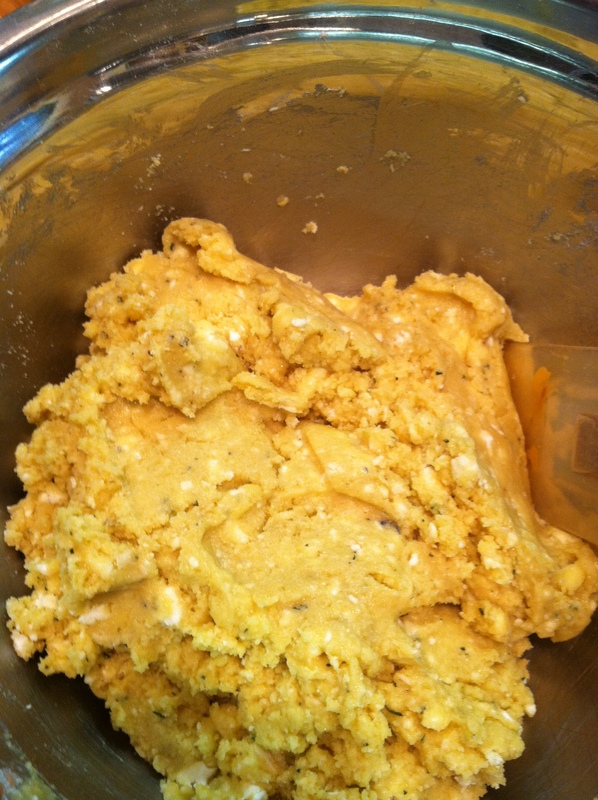 Use only the lavender buds because that is where the essential oil, scent and flavor is, not the stems or leaves. If you “hyper-heat” the mixture to a boil or heat in the microwave, you will get a very bitter flavor from the lavender. Use too much, you can end up with that “old-lady soap” flavor and no-one wants that! The amount to use is 1/2 tablespoon to 1 cup of honey. Once the honey has cooled back to room temperature, strain out the lavender. The lavender imparts a very delicate color so if you use a light-colored honey you will see the lavender hue. You won’t see it in darker honey. 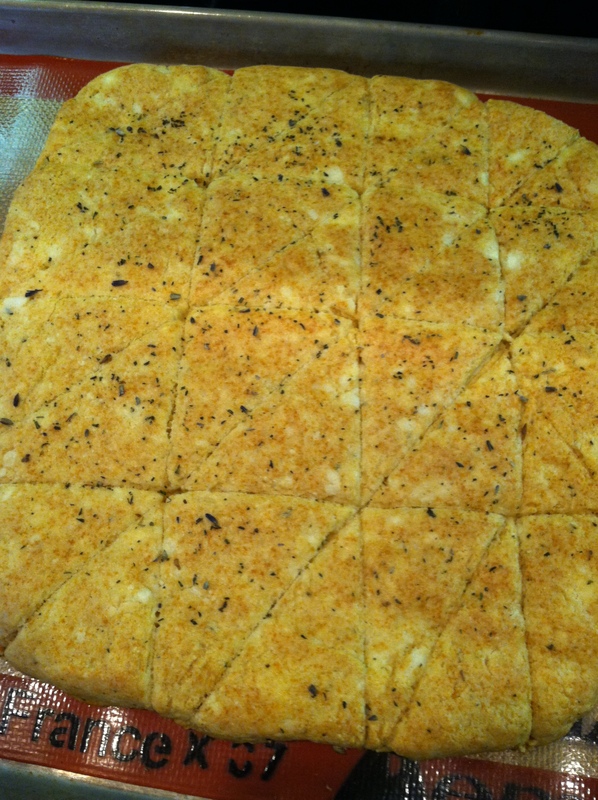 Cut goat cheese into dry ingredients until it resembles coarse corn meal. Add to flour mixture and mix until incorporated. Cut into triangles or other desired shapes. Bake at 350° F until golden brown; about 10-20 minutes, depending upon how thick the dough was rolled out. Pat the dough to desired thickness and shape; cut into triangles or desired shape before baking. 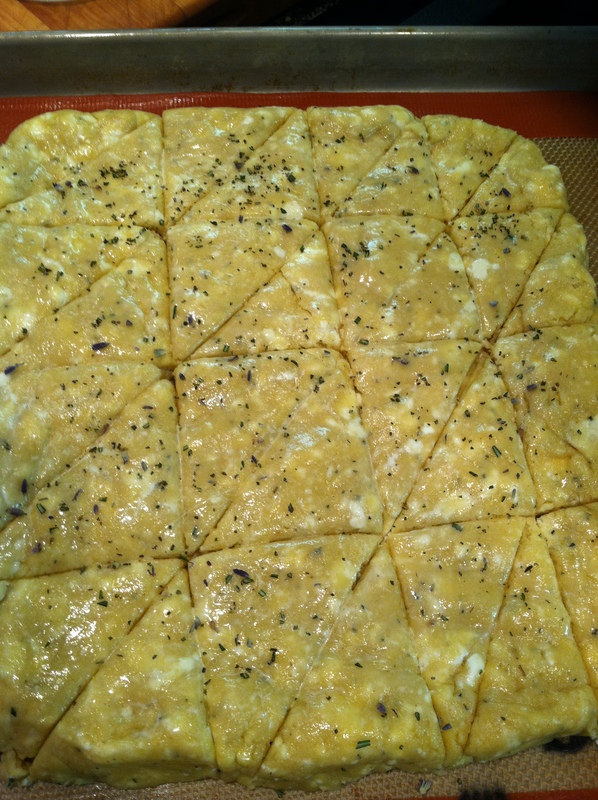 If desired, spread with goat cheese and drizzle with lavender honey. These scones make a great breakfast! I also like to serve them with roasted leg of lamb. If you didn’t like goat cheese, you can substitute cream cheese. 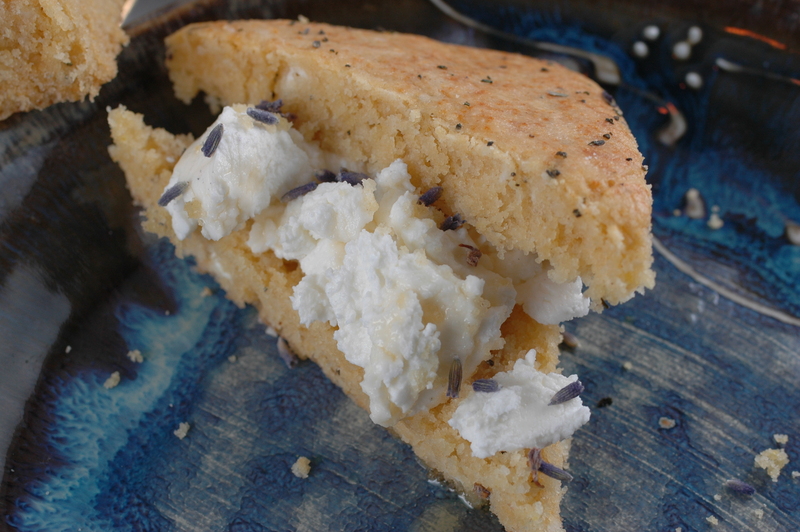 This entry was posted in Recipes and tagged Bake, Baking powder, Flour, Goat cheese, goat cheese scones, Honey, Lavender, lavender buds, lavender honey, Olive oil, Rosemary, Scone. Bookmark the permalink. Wow- these sound really good! I haven’t baked/cooked with lavender before. I may have to grow some when I move into my new place (hopefully with a backyard). Yum! Just be careful not to use too much. lavender can be strong and you only want to use the buds. It is a great plant to grow. Thanks for the tip! I have a history of killing herbs… I’m hoping they’ll fare better outside. Most herbs don’t like too much attention. Ignore them, make sure they get some water and plenty of sun. I always say ‘thank you’ to the plant when I clip. My thyme and lavender plants have been with me going on 15 years, rosemary and chives nearly 7. Scones are like cookies, lots of variations!